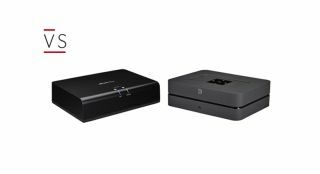 Arcam rPlay vs Bluesound Node 2 – which is better? | What Hi-Fi? Arcam rPlay vs Bluesound Node 2 – which is better? Two well-regarded streamers, moving in opposite directions where price is concerned... which one takes your fancy? Some types of hi-fi equipment feel like they could last forever. A good turntable you picked up in the 70s, for example, could still be happily spinning records today. Other tech, such as your smartphone, is visibly overhauled year after year. Some products - streamers, for instance - are being made notably better. Even if, on the surface, it’s not immediately clear how. There’s no clear specification, beyond file compatibility, to draw comparisons between different models. That’s a lesson we learned after pitting Bluesound’s Node 2 – a streamer that been around since 2015 – against 2017’s Arcam rPlay. The Node 2, in fact, has gone up in price since we first tested it – from £430 to £500. The rPlay, meanwhile, started out at £400, had a temporary price drop to £330, and has now settled back at its original price. At first glance, there aren’t too many differences between the two streamers. Both boast a similar set of features, both are used in pretty much the same way. In fact, people who want to move their music from their computer to a dedicated NAS unit, and require a good streamer to act as middleman, won't be able to tell which is the better streamer simply by looking at the specifications. But when listening to both, it’s clear to see how far the quality of streamers has come in just under three years. Can the Node 2 retain its charm when set against the new blood? Controlling the Node 2 - there's no physical remote - is Bluesound’s BluOS dedicated app app. It can control any and all Bluesound products. The DTS PlayFi app, which operates the Arcam rPlay, can be used with a range of products from other companies including Pioneer, McIntosh, Rotel and Polk. Both DTS PlayFi and BluOS give you the ability to stream music from one source throughout your house, whether that’s Amazon Music, Tidal, Spotify, Qobuz, Napster or Deezer. They also grant access to internet radio stations, not to mention NAS (Network Attached Storage) drives on the same network. The Node 2 supports uncompressed FLAC, ALAC and WAV files up to 24bit/192kHz, as well as other popular formats such as MP3, AAC, WMA and AIFF. That means if you’ve got a music file, the likelihood is the Node 2 can play it. Like other Bluesound products, it can also handle MQA audio from the likes of Tidal. The BluOS app has a more stylish design and speedier response times than the DTS PlayFi. We find it faster when switching between music sources, and the black-and-white colour scheme looks smarter, to our eyes, than the multi-coloured icons and jumpsuit-orange of the DTS PlayFi app. However, the rPlay has its own benefits. The DTS PlayFi streaming platform is, as we said, available to a range of manufacturers - which gives greater flexibility when choosing products you use to make up your system. You're not tied to a single company's ecosystem as you are with Bluesound. The rPlay can match the Node 2 for hi-res streaming, also supporting audio up to a 24bit/192kHz resolution. When it comes to a range of services and radio stations, both have very much the same variety - but if you’re a Bluetooth user, we’re afraid Arcam leaves you in the cold, as it’s the one major feature left off the rPlay’s resume. As omissions go, it's a big one. It’s always a plus when your hi-fi looks, as well as sounds, good. To their credit, both the Bluesound and the Arcam streamers have sharp designs - but in terms of aesthetics, it comes down to personal preference. The rPlay has a pair of volume control buttons on the top of each streamer, while the Node 2 opts for touch-sensitive controls to skip and pause your audio. We prefer the latter, as it has greater usefulness in day-to-day operation. Connecting an rPlay to an amplifier or external DAC is straightforward, via either its line-level outputs (one fixed, and one variable which uses the same volume control as the company’s A49 flagship amplifier) or its single coaxial output. The Node 2, meanwhile, offers one each of optical and analogue outputs as well as a coaxial digital out, an optical/analogue input, and a high-power type A USB port. It bests the rPlay for connections. Naturally, the most convenient connection for both streamers is via wi-fi - though, as usual, we’d recommend going via the direct ethernet route for the most stable results. So far, so good. But when it comes down to the most important aspect of any streamer – sound quality – both the Node 2 and the rPlay have stuff to strut. We start with some music from our NAS drive, a 24bit/192kHz of Gotham’s Reckoning, the theme of super-strong Bane. Hans Zimmer’s work is an intense piece that starts off slowly before building into a stirring attack, and the rPlay streamer is more than happy to convey those elements. It has a great sense of timing, able to master the rapid strings that dart back and forth, building the excitement for the appearance of the main villain. At the beginning, it sounds almost like the distant hum of mosquitos - but soon the soundstage is full, every one taking up a distinct space, and rPlay keeping them all in line. A few moments later, with clap-like electronic notes that leap forward, teeth and claws bared, the rPlay captures the changes in intensity between the quiet bass notes and the strident, louder strikes. The Node 2 finds it difficult to contend with the Arcam’s dexterity, as its handling of dynamics is almost tentative by comparison to the rPlay’s energy and drive. In its own right it’s an adequate performer, and the changes between softer notes and lightning-crackle synthetic sounds are well defined - but it seems to be holding back, not quite displaying the same level of animation as the rPlay. We play Paul Simon’s Diamonds on the Soles of Her Shoes (the unreleased version from the Graceland 25th Anniversary Deluxe Edition album) and immediately hear a marked difference between the performances of the Node 2 and the rPlay. Bluesound’s streamer has a good ear when it comes to detail, and can dig down deep enough to convey the reverberations in the opening bass lick. Play the same track through the rPlay, though, and there’s a notably more nuanced and refined rendition. The texture of the bass guitar is described with greater sophistication, giving emphasis to the reverberations of each string. After the first few bars of that riff, Simon starts singing with clarity and crispness. His vocal is handled with greater delicacy by the rPlay, so much so that it makes the Node 2’s rendition seem almost crude by comparison. Change to a lower quality stream from Tidal or Spotify and the characteristics remain consistent. The Node 2 does a decent job, helped in no small part by its easy-going tonal balance. You can listen to a range of sources and genres for hours, yet still enjoy the relatively spritely performance. But it doesn’t come within striking distance of the rPlay, which ultimately provides a much more nuanced listening experience. For anyone already invested in Bluesound’s multi-room system, the Node 2 is certainly a good – and convenient – addition. The control app is better than that of its competition, and having Bluetooth connectivity gives it a further connectivity advantage over Arcam’s rPlay. But that price difference can't be ignored. It’s rare a product drops from a five star rating – which the Node 2 was in 2015 – to a three, but considering you can pay £100 less than the cost of Bluesound’s streamer for a product that ultimately provides preferable sound quality, it’s the only rating that seems appropriate. For those who want to pick and choose the best product at each stage, rather than tie themselves to one manufacturer, the rPlay offers a more sophisticated, more energetic and more enjoyable sound. It's one we have no reservations in recommending. The rPlay received a What Hi-Fi? Award last year in recognition of its talents and, going into 2018, it remains the one to beat.